Brett sports unholy alliance of green/nuke colors while pointing out road hazard ahead. After doing HMBway recently, I've been itching to do some more climbing (Tunitas was awesome), and wanted to incorporate something along those lines in Skyline since HMBway unfortunately is slightly incompatible with work. Solution: more Skyline! 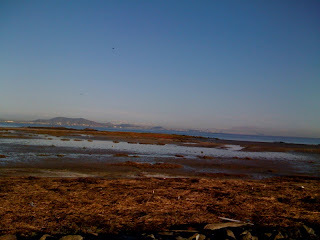 It was a beautiful morning, with the sun out even in Daly City, which definitely made route extensions a compelling option, although I didn't say anything about my plan as I hadn't quite committed to it myself (yeah yeah, I'm lame and non-committal). Despite the sun, SCT was freezing cold (wtf?!) and I think I saw a couple of Michael's fingers lying on the side of the trail, having fallen off due to lack of adequate gloves. But after all, the sun _was_ out and it was beautiful, and Trinh gave me a cue and said it would be nice to go all the way to Santa Cruz on a day like this (I swear I didn't set it up!). I unfolded my devious plan to lure Ed and Michael up the mountain with me. These brave gentlemen did not hesitate for long and we headed off. In anticipation of the upcoming climb, I even forgot to exclaim my usual "I hate hills!" 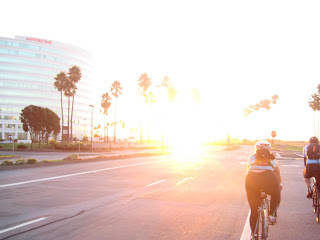 as we pedaled up towards 92 on Skyline. And here we parted ways with the Skyline route as we know it, turned right on 92, did not get killed by trucks, and arrived at - Skyline! (Wtf is up with that road? It just keeps disappearing and reappearing in different places.) Again, we did not get killed by trucks as we did a left turn onto Skyline (this was quite an accomplishment). Going up was beaaaautiful! The road goes along a ridge with views both of the valley and the ocean. Well, it would have had views of the ocean if the ocean hadn't been all fogged up. We climbed and looked and climbed and looked and climbed and climbed and climbed and climbed. Pesky rolling hills of Cañada begone! Well... at the top there were actually a few rolling hills, meh. But they were at least steep enough to properly identify themselves as hills, as opposed to Cañada where you just suddenly find yourself inexplicably weak until you realize that the road is, in fact, not as flat as it looks. At the top, Michael called me an evil woman while Ed stopped to fiddle a bit with his wonky breaks, thinking they may be of use during the descent on King's Mountain Road. I'll blame him dropping me on the descent on my functioning brakes. Ed had a scary near-car experience on the way down but we still all enjoyed the twisty road. It's kind of like a roller coaster, except way more fun and less safe! Whee! Helpful tip: do slow down when the street signs claim you should. This is not SCT. Once down and having reached Woodside, Michael said I wasn't an evil woman anymore. 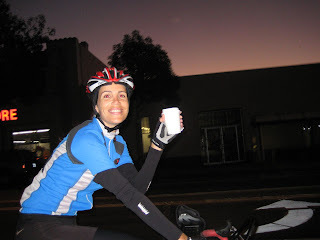 After a somewhat eventless ride back on Sandhill Rd/Junipero Serra we reached Google way past breakfast time. - 2000 ft more or so of climbing! - PRETTY! Depending on weather, may beat HMB for most scenic route depending on weather. - Oops. Very late arrival at work, although not as bad after HMB. Route: Kind of like this, except SCT isn't on the map. become my favorite in the Bay Area. Nice tranquilo cruise w/ Hobinator, Heather, and yours truly. Unremarkably bucolic and nice, one flat, on-time 9:24 arrival. Mr. Sun out in force -- see photo. WTF this is I don't know. Cool-looking anyway. 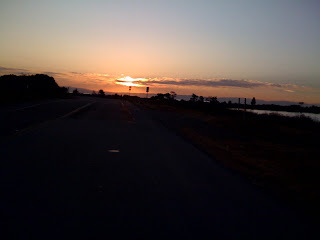 Passable sunrise over lagoon road west of the 101, Brisbane. The home stretch over the 101 from palo alto to mountain view. Entertaining barriers/chicanes to worm thru while on upward leg. 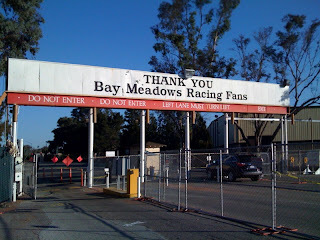 No, thank YOU bay meadows, R.I.P. 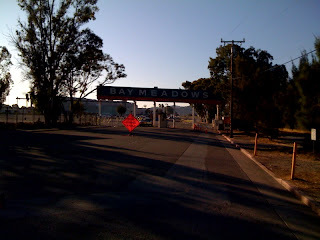 Brett enters the now closed-to-traffic bay meadows lot. 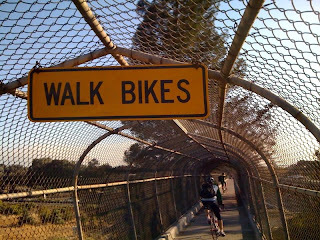 Despite bay meadows' closure, you can still ride your bike thru it. while less grandiose than the hmbway, i'm super glad scott suggested this ride. the following hombres rolled out at a casual 6:40 - brett crosby, naveen, bk broiler, steve and the burr twins: bryan and scott. decent pace, rolling maybe 2:10? despite bay meadows being closed, the pedestrian/bike path through the parking lot was still open, though achtung! pay attention or you will be decapitated by the caltrain platform just before old county rd. for various reasons, brett gave the route the proverbial thumbs down. too many lights / stop signs. i say hogwash! 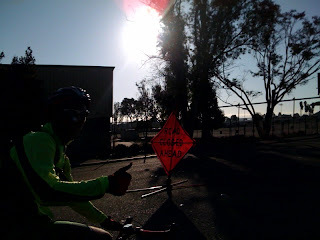 nothing like basking in the warm glow of nostalgia -- old county rd breakaways, colma cemeteries, crazy fixie guy, a belly-strong and head-sure marius attack, more dooring opportunities per mile than any route, and a little bit of real-life grand theft auto: redwood city. 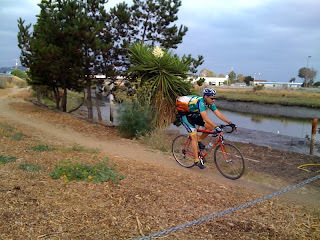 only one mechanical (flat, mine, sorry) and near-miss (me leading the pack into the path of a moving truck, sorry again.) i promise to be better next time. looking forward to the next installment, a few weeks away! i admit it was an excellent suggestion, and despite the incessant moanings of that woman kemler and brett's caesarian thumbs-down (route not executed despite that), i think all generally had a jovial good time. "Burr Scott" and "Burr Brian"
so after waiting a while and seeing no burritos being made, they finally yelled out "OMELETS FOR SCOTT AND BRIAN BURR!!!" 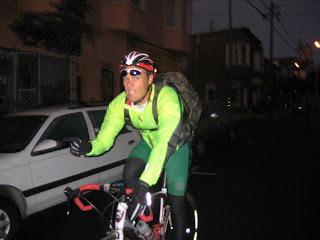 Friday morning: SF2G via Tunitas Creek! I think if you drank 6 beers before you rolled out it might be more exciting. Glad to hear it worked out. So this might become a weekly ride? I'd love to make it out soon. Lina, Topher and of course Stephan himself celebrated the 33rd anniversary of his birth. We all had such a great ride that we decreed (by a 2/3 majority) that Stephan shall have a birthday every Friday! Hwy 1 over Devil's slide wasn't so bad. Thank you Nils for the helpful suggestion getting through Pacifica. The temperature was just right once we got going. No fog, just clouds, and those cleared up as we climbed Tunitas Creek. >> friday, it will be lazy-like. Next week? >> > Anyone crazy enough to join? Post-regroup update: attack, attack, attack, mountain view. Showered and fed just in time for a 9:30 meeting. Anyone for a recovery bayway tomorrow? gloomy non-summery morning. kemler, hobe, sean from linkedin, ed from tivo, jay, and moi rendezvoused at ritual. marius was a negative one as he forgot the "essential equipment" called his bicycle in mtv. everyone got a buddy and rode in pairs until a regroup at the bathrooms to switch dance partners. no sightings of skin-shedding rattlesnake, some sightings of dog, and a couple of alligators. i've come out of a six week bike sabbatical to bid jay farewell (trinh and lina, who've been spreading the rumours of my retirement, missed the occasion). jay will be celebrating his emancipation from mountain view with more sf2gs this week, stay tuned. how i'm feeling tomorrow morning. > > >>> that's the consensus. Otherwise, 6:30 RRR. 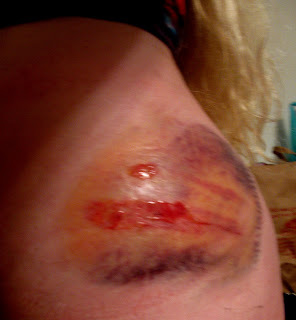 You're looking at my left hip/booty about 24 hours after the crash. It was (and by "was" I mean was and is) oh so painful. And oozy...did I mention oozy? The cuts on my back and arm weren't nearly as impressive. 8/7 Bayway Racepace RRR 6:30 - One for the record books! continues and it is liable to close again, so watch for signs. > of 3 non G riders broke off the front and checked path conditions. > bridge to the floating trailer park. > from and fluffy white cotton candy clouds covering the city. > deer along the second part of sawyer camp trail. 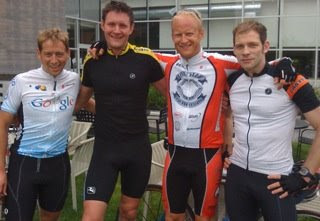 > - a webcor / alto-velo guy was being motor-paced down canada. So I find this entire accident from hell thing particularly ironic because, as my emails earlier yesterday suggested, it's been a super stressful week at work. 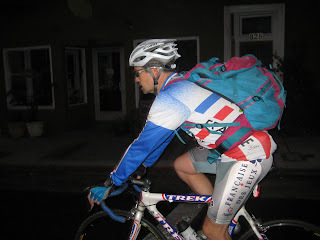 And, sitting in my office late last night, debating whether to sleep in Mountain View or not, I said, "Heather...riding a nice happy Friday ride totally aids in de-stress-ness... so just pack up late, take the late shuttle and ride. It's worth it." So anyways, yes, Stegman and I were trying to re-catch up with the front group (which I lost pretty much right after the break-point) and I was leading for a long while and then Stegman says "Heather... I've been drafting for a long time. Want a turn?" and so I gratefully switched spots. So we were going along in or new line-up for, oh, a minute (while all the while I'm thinking "damn, this drafting thing is a total win situation" when the badness happened. I guess the little kid swerved in front of him and from what I can remember/gather Stegman braked super hard to miss the kid and I, sitting maybe 3 inches off his wheel, didn't even have a chance to break. I just blasted into him... flew... and the first thing that hit was the left side of my head --- and then the rest of my left side just skidded for a second. No lies... about a milisecond after I hit my head (and a milisecond before I started crying) I thought "wow... that was a really hard hit to my head... I now totally get the whole "always wear a helmet" thing"
So about a second after all that my jaw sort of locked up and the very lower part of my head and upper neck hurt really bad. Plus my left hip-booty area was killing me (later I saw that I skidded pretty much the entire left upper side of my shorts off). 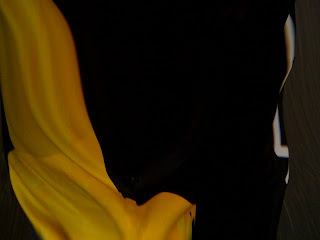 I was crying and holding the top of my helmet as Stegman was trying to see how bad I was and if he should call 911. I kept saying (though the sobbing) "No no... ambulances are like a zillion dollars! Just give me a minute"
but of course... the more it hurt and the more I realized it was a head-injury primarily, the more I realized a trip to the ER was pretty much an inevitable part of my future. So I got to cry in front of a lot of firefighter dudes and got strapped to a board and all that so they could make sure I didn't move my neck and all. Now I think the pain plus the fear of having broken something in my neck/head no doubt added to me having poor baby tears streaming down my then totally encased head all the way to the ER. The nice ambulance dude was quite nice, though. Someone held my hand for a bit. I felt like I was two. They also did a bunch of x-rays to make sure nothing was broken. Turns out-- no breaks! > up on the scene (the kid had mysteriously dissapeared at this piont). > took her to Kaiser in Redwood City. > her left side is scraped up quite a bit, though"
> presumably brought it safely into work. > in session so be extra cautious when rolling through. > Best wishes for speedy recovery Heather! > BTW, I think Shou probably still has your bike. >> > I'm in from Milbway - will be there at 7:30. Godspeed. >> > On Aug 28, 8:29 pm, "Heather Whitney"
>> > > > Yowza, if my pager cooperates I'm in from Martha's on Cortland.